Scholarships and Grants at AB. Did someone say free money? Scholarships and grants are funds that do not need to be paid back. There really isn’t much difference between a scholarship and a grant. Although the general consensus is that a scholarship is primarily awarded for academic merit (good grades), a talent, or for something you have accomplished or will accomplish (volunteer work or a specific project); whereas, grant eligibility is often determined by financial need based on your FAFSA results. However, there are financial need based scholarships as well. 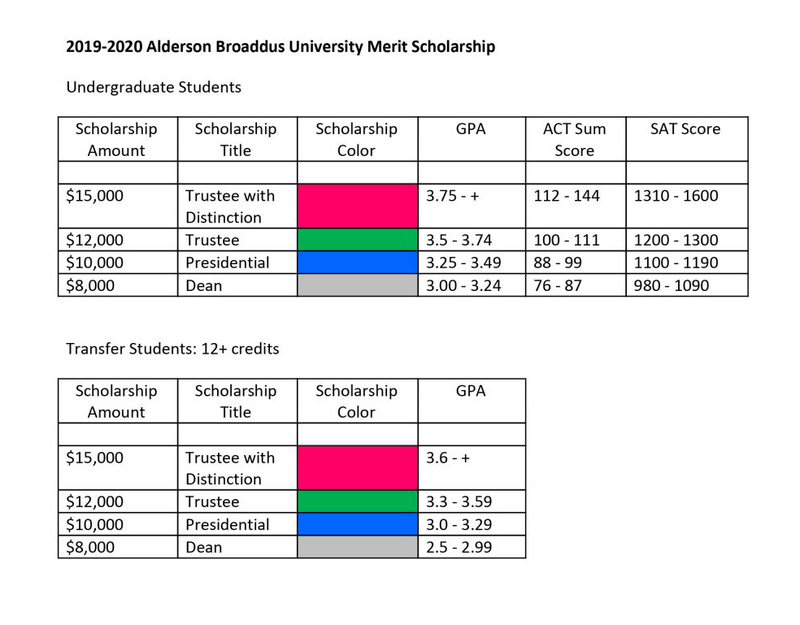 Alderson Broaddus University Scholarships and Grants are earmarked for full time, undergraduate study for up to eight semesters. 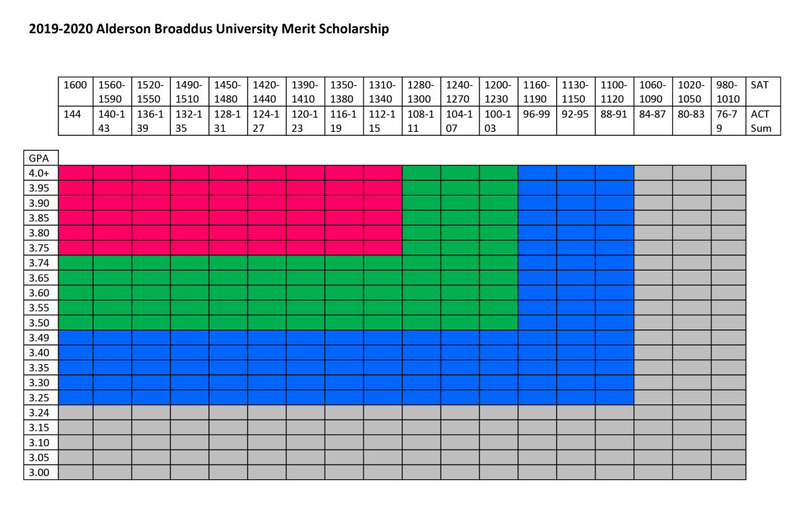 AB Academic Scholarships are tuition specific. Other AB Scholarships and Grants may be used for tuition, fees, room, board or other COA components. AB Scholarships and Grants based on financial need are awarded based on a formula after all other federal, state and institutional funds are considered. Therefore, need based AB Scholarships and Grants may be reduced if federal, state or institutional funds increase or if EFC or COA changes. AB funds are awarded during fall and spring semesters only and are not awarded for summer term. Students who are eligible to receive benefits for Tuition Remission or Exchange are not eligible to receive other AB Scholarships or Grants. Athletic aid awarded per contract requires that all contractual provisions be met. Click the images above for full size. All incoming undergraduate students admitted to the university are considered for AB Academic Scholarships during the admittance process. 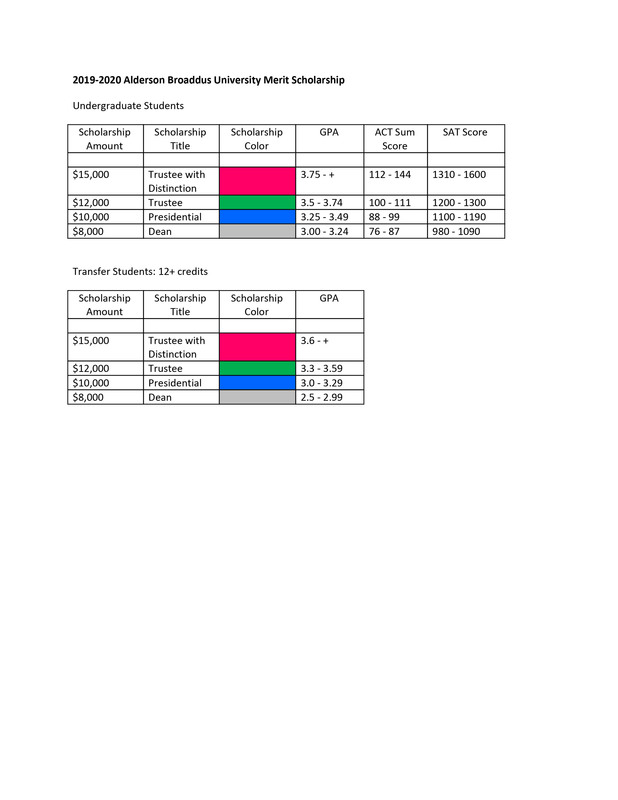 Note that student must meet BOTH GPA and ACT/SAT minimum criteria for each level – so scholarship amount is determined where the GPA and Test Score intersect. This scholarship may be awarded to students who enter AB as new students beginning Fall 2016. Go Give is need based scholarship. Students must complete community service hours to maintain scholarship funding. This scholarship is awarded to students whose grandparent, parent or sibling is a graduate of Alderson Broaddus University. 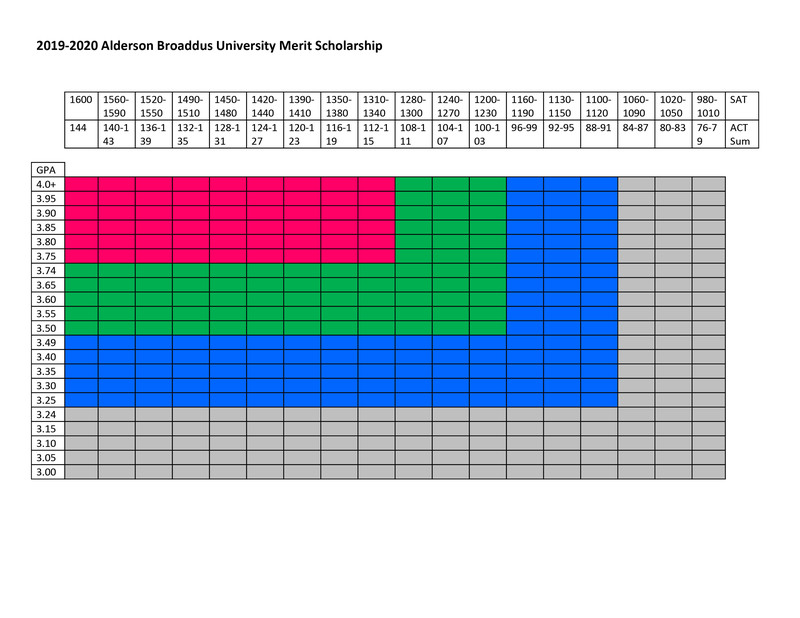 The Legacy Scholarship may be combined with only one other non-need based AB Scholarship. WV PROMISE Scholarship is a merit-based financial aid program for West Virginia residents. Students who achieve certain academic goals are eligible to receive funds to help pay for college. Institutional funds awarded to students demonstrating exceptional financial need after all other federal, state and institutional funds have been applied in order to give students an opportunity to pursue post-secondary education. Pell Grant is a federal need-based grant awarded to low-income undergraduate students to promote access to post-secondary education. Grant amounts are dependent on the students expected family contribution (EFC), the cost of attendance (COA), the student’s enrollment status (full-time, part-time) and whether a student attends for a full academic year or less. Federal Supplemental Educational Opportunity Grant (FSEOG) is a federal grant awarded to undergraduate students with exceptional financial need. Priority is given to Pell Grant recipients. Funds are limited and awarded to eligible students based on FAFSA submission date until funds are depleted. West Virginia Higher Education Grant (WVHEG) is a need-based financial aid program for West Virginia residents. Awards are based on demonstrated financial need. Pennsylvania Grant is based on financial need and awarded to eligible PA students. A student may be eligible to receive a portion of his or her PA Grant while attending AB. For more information about applying for VA Benefits as a student at AB, please speak to Mrs. Saundra Hoxie at hoxiese@ab.edu. Alderson Broaddus University may be notified by the Veterans Administration about your VA benefits, but you should still notify the Financial Aid Office at fa@ab.edu of your benefits yourself if you have not done so already. Early notification will enable us to communicate with you about any adjustments that may need to be made to your AB financial aid so that you can plan accordingly. In some instances, it may be permissible for a student to receive VA Educational Benefits that when combined with other financial aid exceeds the cost of attendance for the academic year. However, AB encourages students to limit their educational borrowing to no more than absolutely necessary. Educational loans must be repaid. Your Federal Financial Aid (Pell Grant, SEOG Grant, ACG/SMART Grant, Perkins Loan, Subsidized and/or Unsubsidized Stafford Loans) will not be reduced due to your receipt of Veterans’ Benefits. Your Alderson Broaddus University financial aid could be affected by your receipt of Veterans’ Benefits. A student’s receipt of any combination of institutional merit aid, federal aid, state aid, veteran’s educational benefits and/or institutional need based aid may not exceed the institutionally calculated financial aid eligibility. A reduction of institutional aid would only occur with institutional need based aid according to the institutional need based formula.